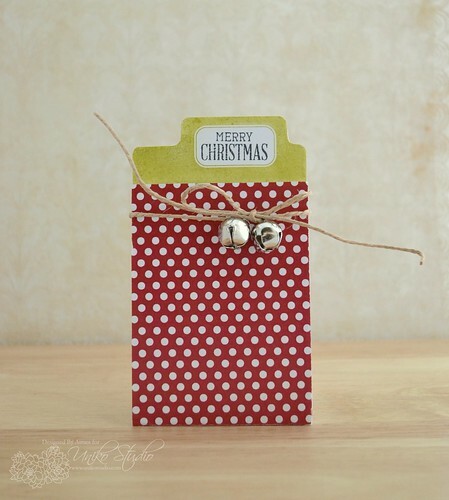 Crafting Confessions: Christmas: Uniko Studio Style! Can you feel it? Can you hear it? Yup - those holidays are coming and before you know it we'll be celebrating the season! Now we're a little bit crazy in our house: seeing as we've decided that December is the perfect time to move house we've had to be super organised when it comes to Christmas. The shopping is done, we're gatecrashing family for the food (and company of course!) and thanks to the new release from Uniko Studio, most of my Christmas crafting is complete! So get ready to celebrate the season (or any other season!) Uniko Studio style! Love is an understatement when it comes to this set - I want to stamp labels on EVERYTHING! I've never got jingly for the season but after seeing my buddy Diva rock the bells on her festive creations I just had to try for myself. Cue me jumping around the room jingling this gift card holder - I may struggle to part with it! Simply slide up (or untie if you fancy trying to tie it back up again!) 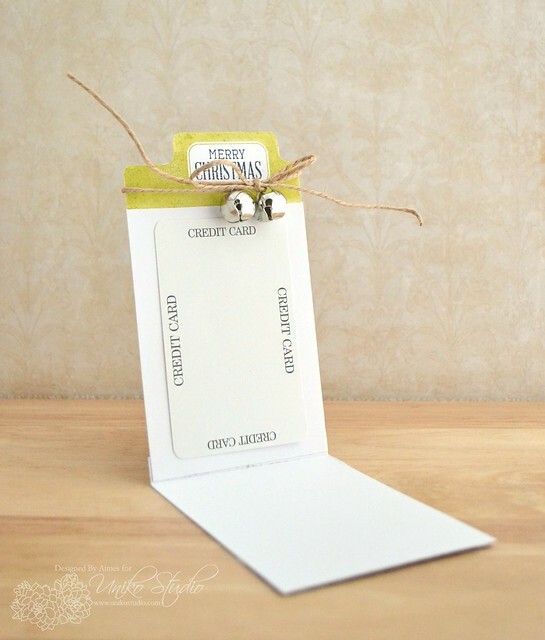 the twine to reveal a pocket to house the gift card of your choice. I also inked up the set Wonderful Washi: Christmas and combined it with one of the new digital cut files: On The Edge. Stamping on acetate is always magical to me and that snowflake strip coordinates perfectly with the the digi cut methinks even if it is a pain to try and photograph! Now I told you earlier that my Christmas shopping was done. 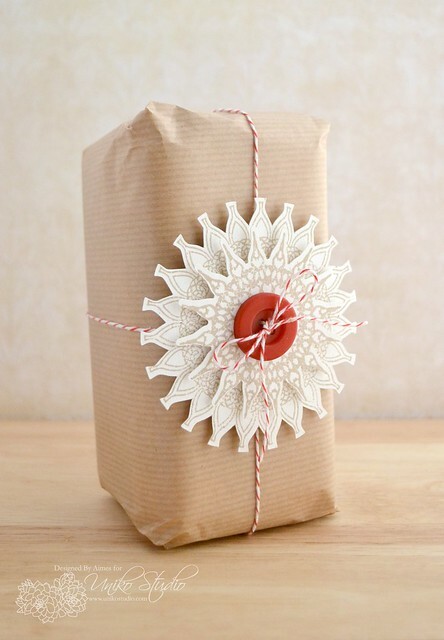 And now, thanks to the digi cut file: Decorative Doilies - The Hands of Time, my Christmas wrapping is done too! 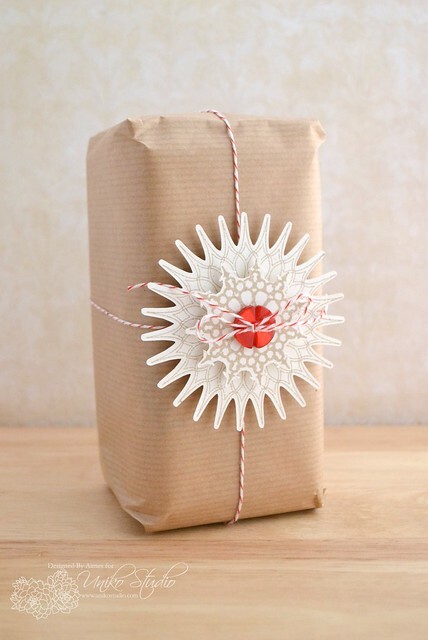 Such a simple idea to decorate a present and I'm a sucker for kraft and red for the season. 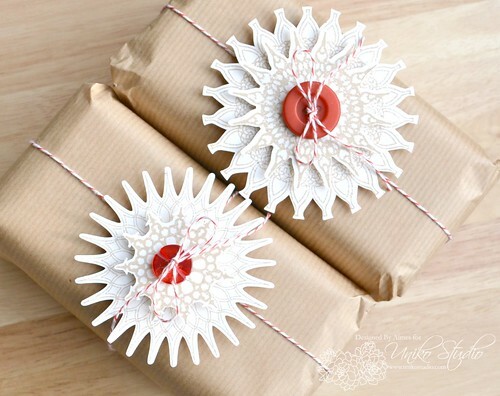 I simply stamped the doilies from the set, Decorative Doilies - The Hands of Time and layered them up to create a pretty present topper. 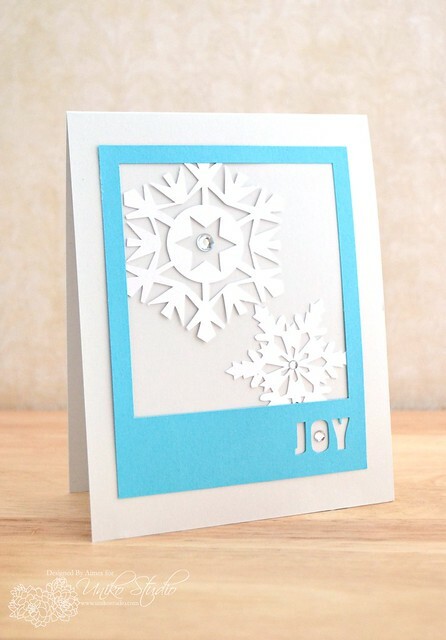 Still on the digi cut files, I used the Christmas Polaroids and Sparkling Snowflakes to whip up a super-simple, super graphic card for the season. Easy as 1,2,3 for this card! The hardest part: deciding whether to add a gem to the JOY sentiment! Now it's like all your Christmases have come at one over at Uniko Studio because on top of all of this, there's also 7 new digital paper collections too as well as 2 digital stamp sets! All of these projects are just fabulous, it is difficult to choose a favorite! oh my goodness....definite eye candy galore! Wow these are all cool, love the acetate touch and the brown paper packaging and the snowfakes... guess I like 'em all. All kinds of gorgeousness Aimes...those cut files are absolutely stunning. I hope the moves goes off without a hitch! Your projects are wonderful!!! Wishing you a very Merry Christmas in your new home. Wow!!!! This was a fab post! My fav? The packaging! And that let it snow die cut! So many beautiful creations Aimes! Wow...a stunning array of projects! OMG Aimes - what a collection of eye candy!! Amazing! Lovely projects and I love the digi cuts. As for moving at Christmas, well I know how that feels!!! We moved to France 5 days before Christmas (not through choice, the people buying our house wouldn't wait until the New Year) What one crazy move that was!!!! I well remember being jammed into the car with jars of mincemeat stuffed in around my feet! I hope your move has a little more karma!!!! Bonne chance! Beautiful Christmas presents - love the kraft and red/white. Lovely image. 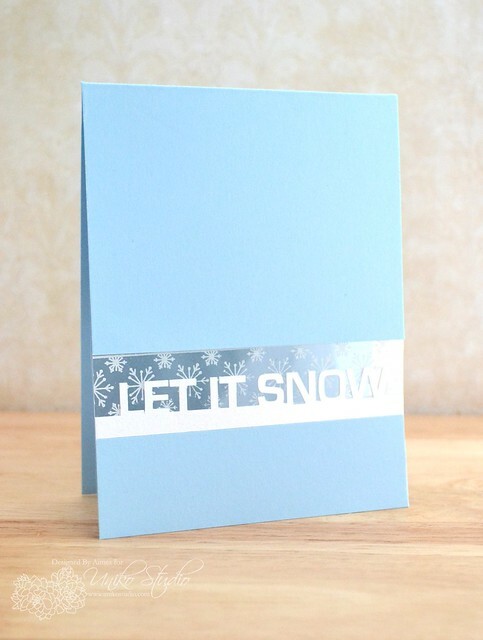 The Let it Snow card just blows me away! Stunning! !